Bernard Miller concentrates his health care practice on a broad range of regulatory and transactional matters. He has experience conducting research, performing due diligence and providing guidance related to a variety of health care regulatory issues, including Stark Law; Anti-Kickback Statute; Health Insurance Portability and Accountability Act of 1996 (HIPAA); Health Information Technology for Economic and Clinical Health Act (HITECH); state telehealth/telemedicine laws; state assisted living facility laws; and Medicare reimbursement, self-disclosure and overpayment requirements. Bernard's health care transaction experience includes mergers, acquisitions, reorganizations and joint ventures. 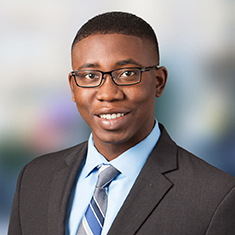 Prior to attending law school, Bernard worked as a high school precalculus teacher with Yes Prep Public Schools in Houston. Shown below is a selection of Bernard’s engagements.